Connect Rocket will then forward a message and a link to the subject. Once received, the subject simply clicks the link and if required (based on their privacy settings) allows their phone to share their location. Once they've done this, their phone will send their GPS location (Degrees and Decimal Minutes) and estimated accuracy back to the person who sent the original text message. If you or your subject do not have cellular coverage, Locate will not work. Locate works with all smart phones with onboard GPS. 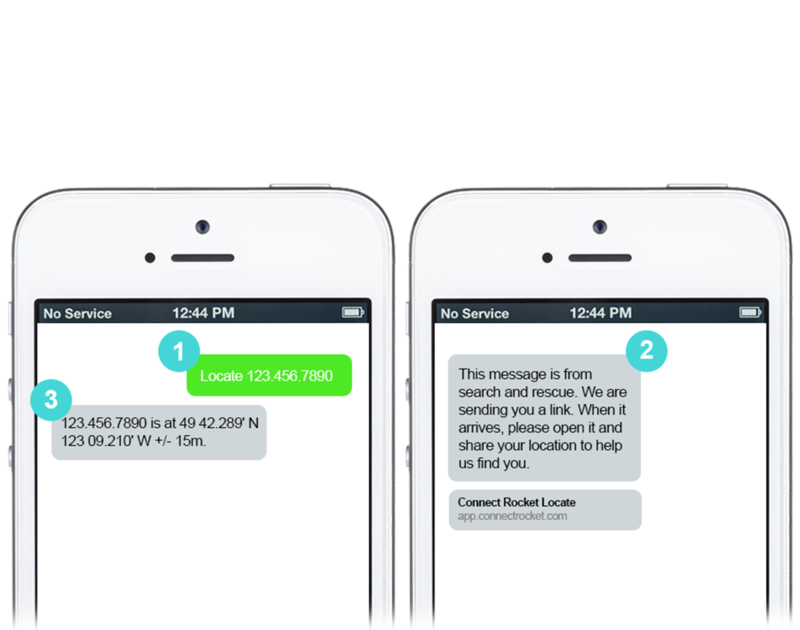 Locate requires a phone with a data plan and the capacity to send/receive test messages (SMS). Connect Rocket will prompt the subject to leave their browser open while further attempts to refine location are made at preset intervals. This allows the phone time to better orient itself and refine the device's location. Remember that Locate is only one way of finding a subject and it should be utilized in concert with other information that is available to you about a subject's location. Locate content being sent to your subject can be customized to suit the needs of your organization. Where possible, speak with your subject or bystander before sending the location request to tell them what to expect. Once you have established a location, have your subject close out all applications on their mobile device to conserve battery power. Train with Locate so you remember how to use it and are familiar with the workflow on the subject's end.